Jesus….how much time has he been putting in game last month? Dear Therealisnes, could you pls elaborate your road to victory? Grinding or tasks, tears or blood, just you or “helpers”? After all the shitstorm I’ve experienced during the Progetto Tasks (TK-ing, blocking and all that crap so I can’t be top XP/damage/whatever) I didn’t even bother to read them and went with the XP way without trying to complete the tasks. At least this way I got the Object 277 too. It wasn’t that hard to get, I played prem tier 8 lights the whole time, and did it with a few days to spare (and I’m just a potato player). So, he is bitching about having to pay 6.2 Euro for a t8 prem? time to grab your shades and go outside…. theres your sign…. i got mine at 0849. with 11 mins to spare. 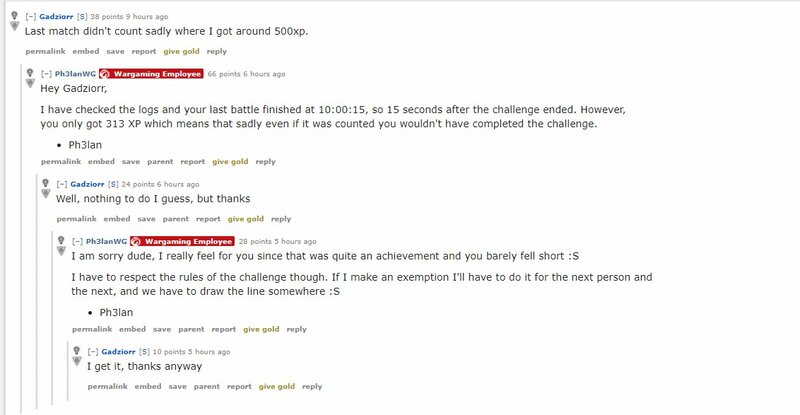 WG being cunts as usual and not counting battles as they should, to base the rewards taking into account when the battle started. They do it correctly for the 1st victory bonus, just not for the missions. If you start the battle in allotted time, then the result should count for the mission that was active when you started the battle.